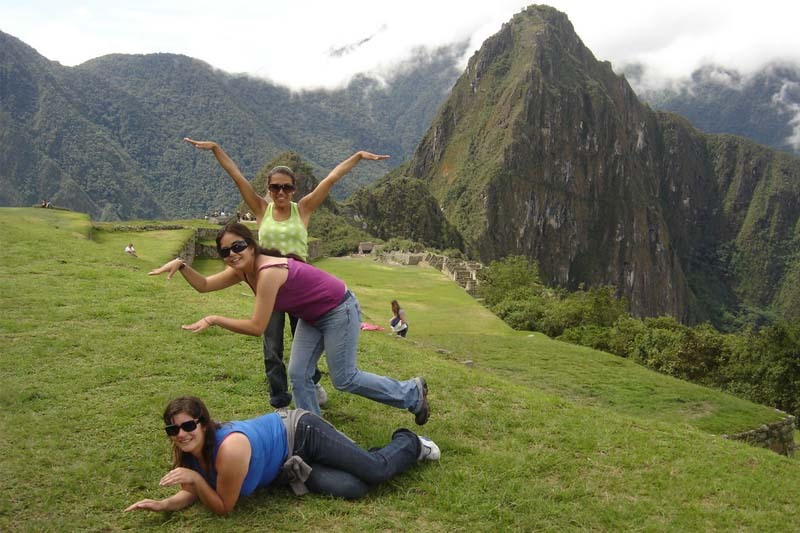 If you visit Cusco and Machu Picchu you will notice that the most common representations of animals are three: the condor, the puma and the snake. These 3 creatures represent heaven, earth and the world of the dead. Today, the Inca trilogy is present in the crafts and paintings of the Wonder of World. What was the way of thinking of the Incas? What was the Inca religion like? What do the condor, the puma and the snake represent? The Incas had a pantheistic conception of the world. That is to say, the sun, the moon, the earth, the plants, the animals and everything that surrounds them are divine beings that have life. Its main gods were the sun (Inti), the earth (Pachamama), the moon (Killa), the ray (Illapa), the mountains (Apus) and many other deities. The Incas took as their own the way of thinking of the Ande inhabitants who preceded them. Thus, they concluded that the Andean god ‘Huiracocha‘ created the world and was represented by these deities of nature. The world was divided into 3 planes: the world above or the gods (Hanan Pacha), the earthly or living world (Kay Pacha) and the world below or the dead (Uku Pacha). The Incas believed that men come from the earth or from the world of the dead. Then they travel through the world of the living. Finally, they rise to the world of the gods. The Inca was the ‘son of the sun’, mediator between the world of the living and the world of the gods. His power was infinite and could not be discussed. The Incas were polytheists. For them there were several gods in nature: the sun, the moon, the earth, the stars, the lightning, etc. Sun (Inti) – The sun was the main Inca divinity. The sun was the husband of the ‘Pachamama’. It gave light and life to things. The Inca was the son of the sun for what was his representation in the world of the living. In his honor the Coricancha was built and the Inti Raymi was celebrated. Earth (Pachamama) – The ‘Pachamama’ was the goddess of fertility. She was represented as a woman. Its origin is much earlier than the Incas. The Incas made offerings with chicha, coca and even animal sacrifices. Many of these customs are still maintained in the Andean man of today. Moon (Keel) – The moon was the wife of the sun. This divinity protected the women of the empire and regulated the winds and the state of the sea. The Incas created many enclosures to venerate the moon. The most important is in the Coricancha temple. Ray (Illapa) – This Inca deity decided the storms, the rains and the lightning. The Incas adored him because it ended with the drought. However, they also feared it because it caused floods and death. In the Coricancha he had an enclosure destined to his adoration. Mountains (Apus) – The Incas, like the men of the Andes many centuries ago, adored the mountains. These divinities were local and provided luck and protection to people. The most important were the highest peaks. For example, the main ‘Apus ‘ Incas were the Salkantay and the Ausangate. Even Machu Picchu was a mountain worshiped by the Incas. The condor, the puma and the serpent were 3 animals that represented the cosmovision of the Incas: the superior world of the gods, the world of the living and the world of the dead. The condor was a bird sacred to the Incas who believed that it communicated the upper world (Hanan Pacha) with the earthly world (Kay Pacha). The condor (Kuntur in Quechua) is a large black bird that lives mainly in the Andes Mountains of South America. Due to its ability to fly over heights of 5 thousand meters above sea level (16,404 feet); for the Inca worldview it was the only animal that could communicate with the world of gods and stars. Currently, the condor is still a sacred bird for the men of the Andes. In some towns of Peru the Andean ritual known as ‘Yawar Fiesta‘ (Blood Festival) is still celebrated, which has the condor as the main protagonist. The puma is a symbol of strength, wisdom and intelligence. It represents the ‘Kay Pacha’, Quechua word that means ‘the world of the living’. Its characteristics are patience and strength. The Andean puma is the subspecies of the puma that inhabits the territories of South America. The puma adapted to the tropical areas as well as to the rugged terrains of the Ande. It is characterized by its strength and agility. For the Incas it was a divine animal that represented the power of the world. It is believed that Cusco, the capital of the empire of the Incas, has the shape of a puma. The head of this animal is found in the fabulous fortress of Sacsayhuaman. The line is in the temple of Coricancha. The serpent represented the infinite for the Incas. The serpent symbolizes the world below or the world of the dead (the Ukhu Pacha). When people left the earthly world they joined this other dimension represented by the serpent. For the Incas the serpent also represented wisdom. On the walls of the ‘Yachaywasi‘ (Casas del saber Incas), there were representations of snakes. One of the most important temples of the Inca City of Machu Picchu is dedicated to the condor. This building is carved in 3 dimensions: his body is carved standing while his head is like an altar on the floor. The snake (‘Amaru‘ in Quechua language) is currently a symbol of bad luck for people. It is believed that the sudden appearance of these animals symbolize death or problems in agriculture. The Incas represented their worldview of the world in these three animals: the serpent, the puma and the condor. That representation is currently called: the Inca trilogy. The Inca trilogy was represented in many buildings of Cusco. In Machu Picchu, the Temple of the 3 Windows symbolizes this vision of the world: the world of the gods, the world of the living and the world of the dead. The chacana was an Inca symbol represented by a stepped figure of 4 angles. This form was taken from the pre-Inca civilizations that used it in constructions and textiles. The Incas used the figure of the chacana in many of their constructions. It is believed that its 3 staggered angles represented the Inca trilogy: the condor, the puma and the serpent. Currently, the Inca trilogy is represented in many crafts of Cusco. It can be found from sculptures, paintings, jewelry, clothing and accessories with this symbol. 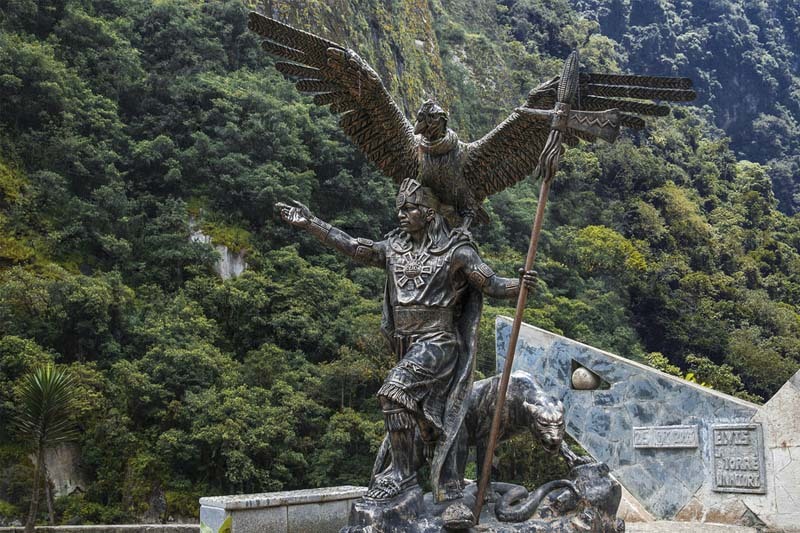 In the town of Aguas Calientes (Machu Picchu Pueblo) there is a sculpture of an Inca surrounded by a puma, a condor and a snake. Likewise, in the city of Cusco, the Sacred Valley of the Incas, the Inca trilogy is in many other representations.